This is a major societal trend. It's related to community, education, the high cost/debt created by and questionable value of college, the end of unions (and the end of things like guilds and apprenticeships), the desire by many people to start their own businesses and needing a place to prototype concepts into products (software, hardware, whateverware) and it's a place where students and elder/experts come together. It feeds our need, as humans, to create, to learn and to teach. First, watch this video (seriously, watch the whole thing; he's a true geek so keep that in mind. 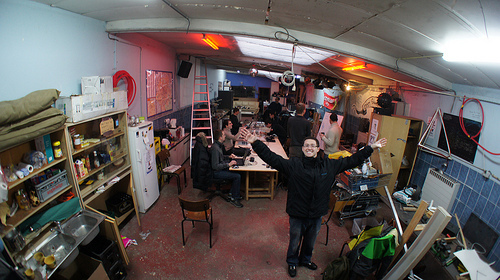 He nails what a hackerspace is, embodies the enthusiasm of it and defines nicely where we're going with them). He seems a bit out there doesn't he. This guy reminds me of all the guys that started the personal computer revolution. All of them. These are the types of people it takes to create large shifts in how society works. These are the people that can (and have) literally, changed the world. OK, get time to get started. Now, get a group of 4-5 people together and start meeting on Tuesday nights (why? Because, that's when all the hackerspaces have open house night, it's random, but you have to pick a night so it might as well be when everyone else is doing the same thing). No agenda needed other than all 4-5 need to have watched the above video. This little group of founders will figure it out. Find a space to rent. It'll need at a minimum a workshop, a classroom and a kitchen (like) area. A lounge, computer room and office would be good, but not required. It should be as nice as it can be, but at the same time, as cheap as it can be. It needs as much internet bandwidth as you can get. It can be smallish at say 1000 SF, or largish at 5000 SF. Our space at denhac (3D render of the space below) is in the middle of that range. 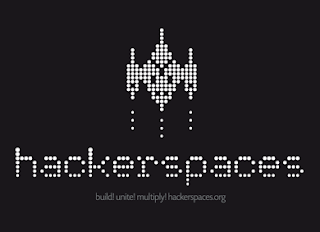 Start accumulating tools that can be shared among the community (see below for a good hackerspace tool list). Decide what it costs to have a membership. This can be anywhere from free (you've got a sponsor or rich member willing to cover costs) to $150+ a month (as an example, one for profit hackerspace type space called TechShop operate this way). I'd suggest a tiered membership with something for students (say, $10-25 a month), regular members ($50 a mo) to a 'patron' type membership (people that want to give more to support the space) of $100-250 or more a month. Apply for 501c3 status. Most other hackerspace have done it already and have been approved. This is NOT required to get started, it's a nice to have and makes it easier to get donations. That's it. No more needed to get started. It really doesn't need to be more complicated than that. A community will form. Thats it. Now get to it. It's about 2500 SF. It has a large garage door (front right)- wanna pull in a truck? You could; cement floors on the first level (perfect for shop gear, etc.). A computer/server room (front left). A lounge area with couches and tables (middle left). A utility room. A Bathroom (unisex). 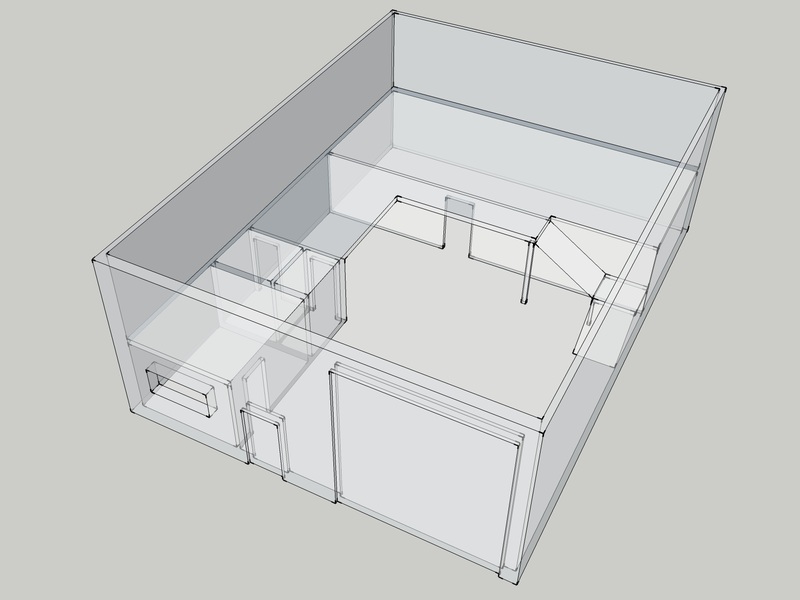 Classroom (back 1/3 of space) and a sort of loft area above that perfect for work stations (electronics, 3D printer, radio/recording station, It's workspace.. basically all the less messy stuff that would require a cement floor goes upstairs). As fitted in the space, require new batteries, and wiring into the space. BIM is such an innovation in the field of engineering and architecture. It provides an inspection services program instead of using a direct API tool for exporting or relying on IFC. "Community and creative expression". Yes. If that doesn't sum it up, I don't know what does. YAY! This is really a great post.Thanks for your approach and sharing.It is such an innovation in the field of engineering and architecture.